I have finished the Mini Pinwheel Quilt and have given it a modern and no fuss look by quilting it with my favorite quilting - straight lines. The back of the quilt is also pieced. The finished size of this quilt is 30 inches x 36 inches. The entire quilt is machine pieced and machine quilted. The only hand sewing I did was to slip stitch the binding to the back of the quilt. These little pinwheels really were very quick and easy to make. Let me know if you have had success using the instructions from my previous post on how to make a template for the pinwheels, or if you have made some blocks. I would love to see them! 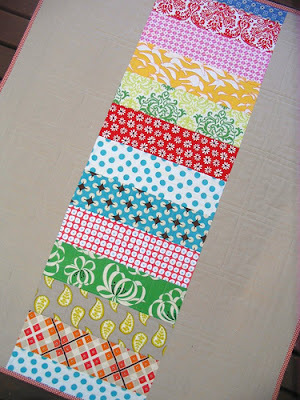 Now I am going to re-focus and prepare the backing for my Half Hexagon Quilt! No more distractions!! Mini Pinwheel Quilt is for sale in my Etsy Store. You will find the listing here. 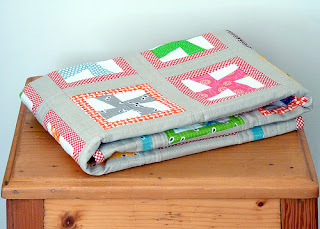 I really like this wee quilt and I love the straight line quilting on it. Very modern and as you say not too fussy. Just right. This is so gorgeous! I may have to make one out of all my Heather Ross fabrics! I love the double border - too cute! Fantastic! I love how you're mixed the plain and the printed fabrics. That is truely gorgeous. You make it look so simple and sooo quick! Oohhh the back looks FANTASTIC and as always..quilting is perfect in its simplicity! Another beautiful creation.Your straight line quilting as inspired me to do the same. you really do work faster than anyone i know!! do you do much else besides quilt and blog?? This quilt is adorable! Wow once you start a project you get to the finish in lightning speed! Love it...fresh, modern, awesome. This quilt is just fabulous! I love the look of the linen color with the pinwheels. You are so quick! The frame around the framed pinwheels was a great idea! It looks wonderful. I LOVE this quilt! Do you get tierd of hearing me say that for every one of your quilts? :) I love the gray with it. Your straight line quilting is great. I need to try and remember to use it more than I do! Stippling is just so much easier to me! Would you STOP! Every quilt you show makes my to do list grow! Beautiful and fun! Busy but not TOO busy. well done! You are a machine!! It seems like you made this quilt so quickly. I love it! I really like this. Honestly, my favourite part is the sashing. It is nice to see the change from white that I've been seeing everywhere. Beautiful. I love those little pinwheels, they are just too cute. I really like your straight line quilting. That is a beautiful quilt, sure it will be a much loved gift. I love the sashing - what is it? It is so cute & modern. The quilting is perfect! I love these. 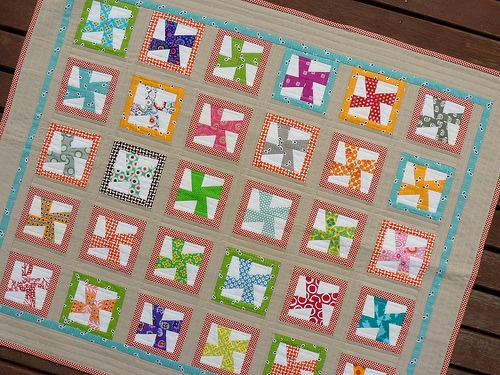 The straight line quilting does look gorgeous. Do you use a walking foot or a darning foot for that? The linen makes it all so lovely. Love the quilt; love the back! Your use of gray is so intriguing to me. I was just reading a little about color theory online today and found some exercises where they placed a gray square inside of squares of various other colors, and in subtle ways, the gray absorbs or takes on other colors. Or something like that :). It was interesting. I'm taking a class on color at a local quilt shop this Thursday, and I can't wait! Wow. That is one VERY adorable quilt!!! Your quilt is beautiful, you may have inspired me to sway from square/rectangle based blocks. this is amazing - it is so pretty and fresh! Love this quilt!!! I thought I was doomed to never doing my own machine quilting because i can not even draw a squiggle let alone sew one!! :) But you have given me hope...I can do straight lines. How do you do you start and stop inside the blocks? back stitching or what? 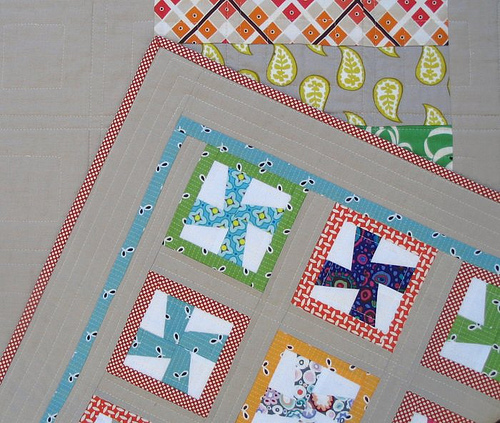 Love, love, love all your quilts!! i too am making a windmill quilt, but mine is a large lap sized. i bought the template at joanns, and found it super easy to use. 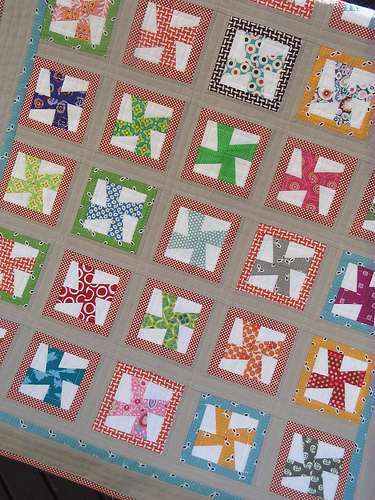 i have all my blocks cut, and am on to sewing....just need it to be a wee bit cooler!! love how you put borders on your blocks, super clever! that quilt is just adorable!!! It's so beautiful and you're such a talented quilter! Can I ask what the sashing is? 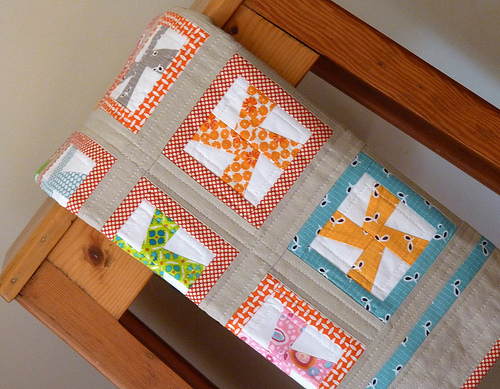 I saw this quilt on your Etsy shop, where it said that is a linen/cotton- any chance it is Essex Putty? Just trying to get an idea of whether it is the right colour for my next project before I order it from the USA (I'm in Melbourne too)! !